The menu and toolbar area stays the same for all Kickdrive project. Opens the Kickdrive Home Project template. Usually, it is a project selector that allows you to pick your specific application. Opens an existing Kickdrive project (.kickzip or .kickpro) or template (.kicktpl). Saves the currently open project including all configurations and additional files used within the project. Changes the User Level. A password may be required. Put all drive units listed in the Module area back to idle mode. The Stop Drives function is not an emergency stop device. It cannot perform any safety or emergency functionality for your drive application. Please ensure that external emergency stop functions are effective, according to the safety regulations and requirements of your drive application. Downloads the latest version of the application and relevant projects. You need to have login information in order to download software updates and additional Kickdrive projects and templates. Please refer to your original Kickdrive distributor or to your supplier for your login data. 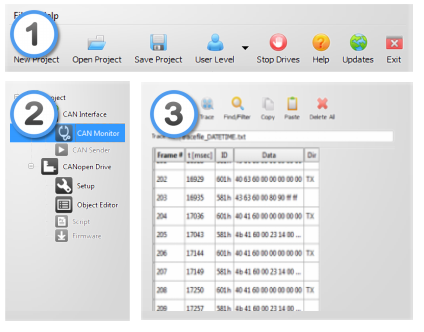 This area shows the Kickdrive Modules available with the currently opened project. Greyed out items are modules that require a higher User Level for access. Editing the module tree is also possible, but requires a higher User Level, too. Clicking on a module symbol in the modules area will open a detailed view of this module or a specific function (e.g. "CAN Monitor") in the content area . The content area allows docking and stacking of several module views. When saving a project, the layout of the content area is remembered and restored when re-opening the project.